Lately I’ve been spending too much time at my very awesome job, commuting, blogging elsewhere, giving baseball lessons, and doing other things in life that take me away from writing here. I took a look at my list of “drafts” and there are now two dozen waiting in the hopper — but, not all are necessarily “ready” by my standards, which is why they’re not yet published. However, I’m going to make an effort to get some of the reviews out — even without much editing — because if I wait any longer you won’t find some of these wines at your retail shop any longer. So without further ado, herewith a review of Murietta’s Well The Spur, tasted far too long ago and likely tasting even better now. A Bordeaux blend — 54% Cabernet Sauvignon 23% Petit Verdot 10% Petite Sirah 9% Cabernet Franc 4% Malbec — from California, but I wouldn’t confuse this with a true Bordeaux. The nose is expressive, dominated by chocolatey spice notes and black fruit — plum, cassis, blackberry. In the mouth you get some sweet oak spice upfront, with blackberry, cassis, black raspberry, and plum flavors following. Decent acidity and dry tannins appear in the finish, which also brings in dusted dark chocolate. For me, this was a hard one to match with food because of the sweet oak character, but it’s a nice “cocktail” wine to drink on its own. For me, it profiles similarly to a modern (i.e., American oak-aged) Rioja. At about $20-$25, this is a good deal. 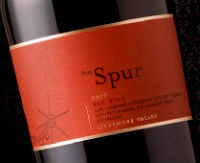 Visit my friend Christopher Null’s site “DrinkHacker” to read a review of Murrieta’s Well The Spur 2009 vintage, which is more likely to be found at your local retailer.